An edifying distillation of the Orange One’s oeuvre, with pictures. Claiming to have read more than 30,000 of Trump’s notorious infodumps (“my bad dreams started around the 10,000th”), Wheeler (I Told You So, 2012, etc. 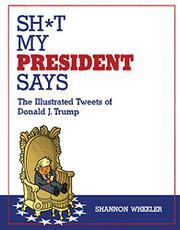 )—an Eisner Award–winning cartoonist who created Too Much Coffee Man and contributes to the New Yorker, the Onion, MAD, and other publications—extracts a redolent selection that frames the current president not as an ogre but a child, albeit, to be sure, “a petulant, misunderstood, self-absorbed, self-righteous, narcissistic, spoiled brat.” And so the cartoonist draws him, with stubby limbs, tiny hands (natch), and clothing that is a size or two too large. Beginning with his first self-promotional warble in 2009 and continuing to diverse paeans sung in March 2017, the tweets are presented one per page or in brief sequences—e.g., a string of variations on “Robert Pattinson should not take back Kristen Stewart. She cheated on him like a dog & will do it again—just watch,” capped with a “Happy Birthday” to Ms. Stewart—for dismayed readers to contemplate. From a wry view of The Don quixotically tilting at a row of repeatedly scorned wind turbines to a toilet over a chirp touting the fragrance “Success,” and, in an even more mocking vein, Trump ogling a pin-up calendar paired to a platitude about International Women’s Day, the accompanying line drawings make the load a little more bearable. Previous similar harvests, not to mention new utterances nearly every day, already prove the tweets hardly need glossing—and that the author’s subject is never going to grow up or learn to show even the most basic sense of decency. Wheeler seems a little shell-shocked by his material, but who could blame him? At least he gives us reason to snicker rather than cry.